Megaesophagus IS NOT A DEATH SENTENCE! of finding a foster or forever home with quality of life and love where its ME can be managed. This website is designed to help you network your Megaesophagus (ME) dog so it may find a foster or forever home. We are NOT a rescue group!!! We ARE a few individuals who work hard for dogs with Megaesophagus when they can no longer stay in a home for some reason or another. When the dog is already with an owner, we work extremely hardest trying to keep it in the home and have been successful in most of those situations. On occasion, we have helped rescue groups save an ME dog from a shelter and get it into the right foster or forever home. Please contact us privately and quickly if that is why you have found our website. 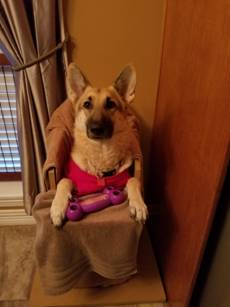 Our German Shepherd Gretyl has Megaesophagus. We adopted her as owner surrender 2 years ago. During her first 7 months, she received no support from her veterinarian as to how she should be managed (eating and drinking in vertical as shown here), so she has a large pouch that formed above her heart. Gretyl will regurg on occasion the rest of her life, but she is happy, otherwise very healthy, extremely hyper, and one of the most active GSDs we have ever had. She thankfully found her way into our home and hearts and will be loved forever!